Synthetic turf is an ideal solution for conservation-conscious landscape architects, particularly those working in the parks and recreation industry. EasyTurf is scheduled to showcase their industry leading synthetic turf at the Las Vegas National Recreation and Park Association Conference beginning September 15th at the Mandalay Bay Convention Center. This year’s NRPA conference is expected to draw upwards of 7,000 attendees. The three-day event is the park and recreation industry’s largest trade show and will feature 400 exhibitors, including landscaping solution EasyTurf. The conference will include the unveiling of the newly renovated Joe Kneip Park in North Las Vegas, a project that was completed in conjunction with the NRPA event. The renovation includes FlexGround surfacing, LED lighting, a new soccer field, and the park’s first splash pad. In NRPA’s spirit of conservation, the splash pad will operate via child-activated timers that will recycle the water via Lake Mead. NRPA recently announced that United States Surgeon General Vice Admiral Vivek H. Murthy will give a special address during the NRPA Opening General Session on September 15th. The EasyTurf booth at NRPA will feature two of its bestselling turf varieties, Nutmeg Lush and Nutmeg Ultra. 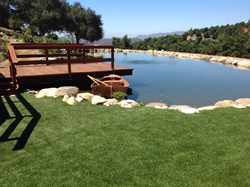 EasyTurf’s synthetic grass systems were designed to meet LEED criteria, appealing to many of today’s conservation-conscious landscape architects. The turf requires considerably less water and maintenance than natural grass, and its durability makes it usable in various climates year-round. For more information on NRPA, please visit http://www.nrpa.org.